I was going to say ‘a fantastic novel’ but I’m not entirely sure that’s what it is. It’s more a historical study, written in a novelistic style, with interjections from the author worrying about turning fact into narrative. I don’t like the term ‘non-fiction novel’. Brilliant book though. 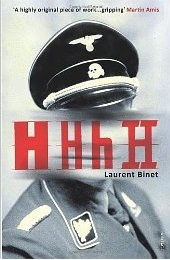 It recounts the assassination attempt upon Reinhard Heydrich, the head of the Gestapo, during the second world war. Anyway, definitely recommended, as is the latest album by The Pines, which I bought with some iTunes vouchers. This is one of the singles from it. Not sure about all of the lyrics, but just listen to the guitar work on it. Tremendous. I like that, it’s sparse but yet more than ambient dub, good stuff.